Dave is the greatest officer I have had the privilege of working with. He was my first ODA Commander. We both arrived to the team within a couple of weeks of each other. He has a wealth of experience with being, at different times, a Infantry Platoon leader and a Scout Sniper Platoon leader in the 101st, ODA Commander, SWAT officer, and Husband and Father who carries all the time. Whenever Dave takes the time to write something, I listen. Let’s talk a little about equipment. You guys all know the different types of people out there. You have the guy that carries almost nothing, just a gun with no spare magazines. This guy is convinced that he is such a great shooter that a fifteen round magazine is sufficient to take down 15 armed terrorists. Then you have the guy that tries to carry everything. This guy has enough rounds on his kit to supply a small army, enough medical items for a platoon, and 20 different breaching tools. This guy carries three times his body weight on his armor. Then of course, we have everything in between. Now that we are done with the humor, this article is not going to be about what or how much we carry, there are so many articles about that it would make your head spin. Instead, this article is going to be about when to introduce your chosen load during your training. I am a firm believer in the old saying “train as you fight.” However, I am also a firm believer in the “crawl, walk, run” methodology of training. First, we start with the basics and fundamentals, the crawl phase. Then we start adding more advanced techniques, the walk phase. Then the run phase, where we put it all together and train as you fight. As you can see, I only stated train as you fight in the final phase. So, when do we put on that armor and full kit? The best way to think of it is that kit is nothing more than an added “stressor”. Stressors are anything we introduce into training that makes the training more difficult. Whether it be turning the lights off, moving targets, shot timers, distracters, or anything else that makes doing the fundamentals more difficult. If we think of equipment in this manner, then ask yourself, when should we introduce the stressor of equipment, is it during the crawl, walk, or run phase. Keeping in mind that when we are working on the basic fundamentals, we do not want to add any stressors, then it makes sense that we do not want to add equipment during this phase. When we have mastered the fundamentals and start the walk phase, this can be an appropriate time to add some gear, but maybe not a full combat load. 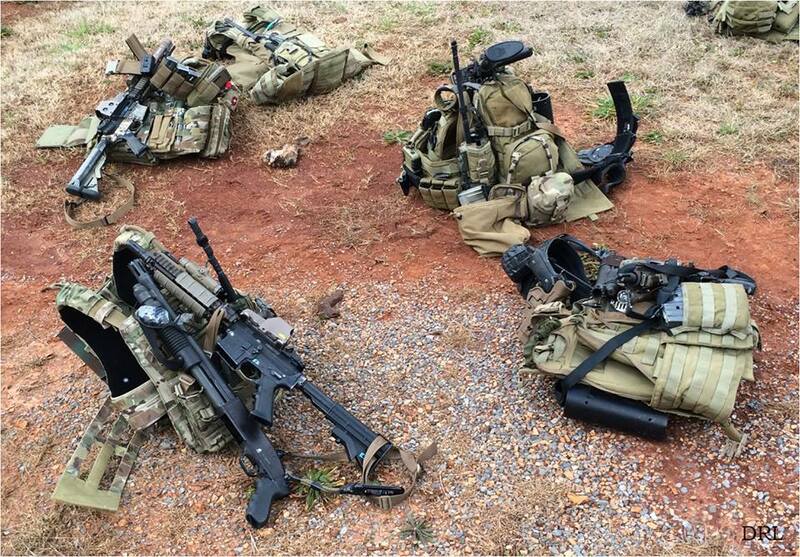 As training progresses, we add full kit and shot groups remain consistent. If equipment is added too soon, shot groups will not remain consistent. There is another problem with adding equipment too soon. We have all been through training when we see people “fighting” their gear, and anyone who claims they have never had this problem will probably also tell you they were part of unit so classified that they cannot even tell you. Bottom line, it happens to all of us. We get a new piece of kit or adjust something, and it negatively affects us until we get the problem solved. So, if we are working on the fundamentals, and fighting our equipment, how can we determine what is causing the shooter to have difficulty making their hits. If we stay focused on the fundamentals, fix whatever problems need to be fixed, then introduce equipment, we will be able to determine how the equipment impacted the shooter and then train to correct that problem. So, here is what I recommend. When you are taking the rifle or pistol “101” course and just learning the fundamentals; leave the equipment aside. Focus on the weapon system, shooting fundamentals and mechanics. As your training progresses, then start to introduce more equipment until you are finally running and gunning in full kit, training as you fight.